6 x 10 Rockwell Satin Nickel Floor Register Discounts Apply ! Brushed nickel registers have a plated finish along with a protective top coat. These floor heating vents feature one step drop-in style installation. 6 x 10 brushed nickel registers are crafted of all steel including the damper. Your floor heating vent offers a fully adjustable steel damper for air flow comfort control. These brushed nickel registers are a classic Mission style design that is timeless. Floor heating vents can also be adapted for wall use when you use wall clips (purchased separately). ***Hint: When ordering your 6 x 10 satin nickel plated floor register, industry standards ask that you measure using the actual duct hole opening dimensions and not your existing register's faceplate dimension. These decorative floor vents will fit a 6 x 10 inch hole opening. Brushed nickel registers can also be retrofitted for use on your walls. Just order these spring clips. 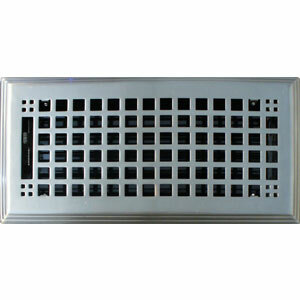 Brushed nickel floor heating vents are ideal for use in your home or office, order today!